Combine two attractions for a memorable experience! Travel by comfortable coach across the Golden Gate Bridge, stopping at a vista point for a photo opportunity. Then visit a winery where you will become "winemaker for the day"! Create your own unique blend, bottle it and take it home with you with your own special label. Then return to San Francisco, your tour guide will drop you of at Fisherman's Wharf. Grab a quick bite to eat before you make your way to Pier 33! Check in to get your ticket and then enjoy your ferry ride and the incredible view of the city skyline as you cross the Bay to Alcatraz Island. You will see and learn things that will amaze you, while experiencing Alcatraz's award winning audio tour! Then leave Alcatraz Island at any time; ferries depart every 30 to 40 minutes; the last departing ferry is usually 6:30pm. *Blending Experience "Be the Winemaker for the Day" then take your bottled blend home with you! 1:30pm - Arrive back at Pier 39. Guide will depart, and you will now be on your own. 1:30pm - Grab lunch or a quick bite to eat at Fisherman's Wharf, or do a little sightseeing if you have time. Then head to Pier 33 to check in and board your scheduled ferry to Alcatraz. It's a 15 minute walk or a quick pedicab ride away (own expense). Note: Arrive 30 minutes (45 minutes for youth) prior to check-in at Pier 33 for the Alcatraz Tour. Voucher will be sent out by email 4 days prior to your tour with info for picking up Alcatraz tickets. 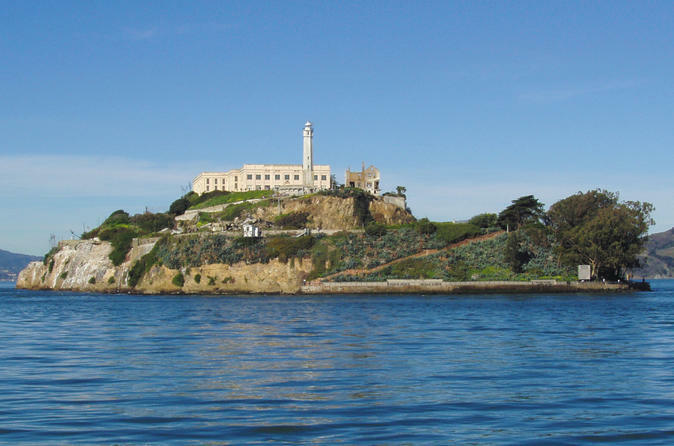 6:30pm - Depart Alcatraz Island (last departure) if you want to leave sooner, the ferry departs every 30 to 40 minutes. Itinerary subject to change in winter season. Winter season November to March.